*screeeeeeech* Put the brakes on for a moment. That sounds nice, doesn't it? It's the way it's supposed to work, after all. Get the body language right, get the handling cues right, and the dog will race over those jumps with great abandon. But let's go back and see what really happened. I set Dahlia up near the first jump in the sequence and lead out somewhat past it. After releasing her, she sails beautifully over the first jump. We run as a pair to the second jump and she sails over that one like a pro. I turn my body so that the set of my shoulder indicates that she should turn after she comes off jump #2 and go over jump #3. She turns after coming off jump #2 and slows down, halts right in front of jump #3. She looks at me as I stand awkwardly with my body turned and leaning over slightly, leading out toward the next jump in the sequence. I freeze in place, keeping the body language the same. Finally, she hops over the jump and looks at me again, just to make sure that she's done the right thing. The remainder of the run continues in much the same way. Always pausing before taking a jump that's on an angle to the last one. Always checking in with me. Always just slightly unsure. This has been how it's gone all along in our agility class. She's gained some confidence. She will go over the jump, but she has to check in first. She has to know it's the "right" thing to do. I asked our instructor at class this week why Dahlia might be like this. Her response? If she had everything in her early life controlled, then it will be harder for her to break out of that, to just do things without always looking for permission. I've sort of had a sense of this. Dahlia was not adopted by us until she was around 2 years old. We have no idea what her early life was like, but I've always had the impression that she was "well trained." Looking at it now, I think "controlled to within an inch of her life" is a somewhat more accurate description. I've never had the sense that she was abused. Far from it actually. She's a very well-adjusted, well-socialized dog. But she's also incredibly polite and shows a lot of signs that her former people controlled everything she did. I made a post once about how it's like living in a backward world with Dahlia. When she came to us, she wouldn't get up on the furniture or the bed. She didn't jump up on us when we came home, no matter how excited she got. She didn't bark or rush the door when someone knocked or rang the doorbell. She had, as the rescue put it, "no bad habits." But looking back at them now, I realize this was due to an awful lot of control her former people probably put on her. Even now, nearly three years after we adopted her, she asks permission to get up on the furniture. She will come to the couch and lay her head on it and stare at you until you invite her up. She will shake her ears in the middle of the night and stare at us until we invite her onto the bed. She will jump up on you only when you ask her to. She's polite and many people love this in a dog. But I wish she was still not quite so influenced by that early control. This sort of "extreme politeness" doesn't work well with agility where the dog has to have the confidence to run out from the owner and do things on her own a bit more. "Asking permission" to do things in agility doesn't work quite so well. I'm trying to sort out, of course, how to break some of that control, but I'm not sure how to go about it. She's learning to relax a little bit, but it's taken a few years and nearly a year of agility class to get her there. This is now my new goal: Get Dahlia to relax and try new things without always having to check in with me. So for those who are reading this, have you run into anything similar to this? If you have any suggestions on how to get her to try new things without being overwhelmed by it all, I would love to hear them! I've not really had anything like that - my rescued dog Jess basically does as she pleases, and Lola will do both what she and I want, usually. Lola is definitely a lot more willing to work independently than Jess, despite her major attachment to me (Jess doesn't really work - but I've noticed it with Ro and my friend's Cairn, too), and I think that has something to do with the amount of shaping we've done. It teaches her to think for herself, and be confident in herself, in a way that nothing else we've done has. I really do need to try to work on more shaping. The first times I tried it, it was an abysmal failure. She did nothing, I stood around and waited and finally gave up. I think she's STARTING to get a little bit of the concept of shaping. I'm just not sure where to start really. It seems so easy for other people and I feel so clueless! I've always done lure/reward training. I wish there were books on crossing over from lure/reward to shaping. Most seem to focus on crossing over from punishment-based training to positive methods. My parents' rescued lab sounds a lot like Dahlia. He knew a lot of tricks when we got him, but absolutely refused to do anything "naughty." On the one hand, it's nice for my parents, who are not trainers in any sense of the word, because he was so good right out of the box. On the other hand, he's impossible to train, because he won't TRY anything. Humphrey, of course, has more bad habits than he knows what to do with. Dahlia really does sound like your parent's lab. She didn't know a lot of tricks (that I knew of) but she had obviously been trained not to bark, not to jump on people, and not to get on the furniture. Most of her early training with us was lure/reward. Shaping was out of the question because she would NOT try anything, but she'd do stuff if you lured and rewarded it. I started to sort if include a little bit of shaping in with the lure/reward stuff, but it was a LOT harder to do with her. I'm kind of glad Dahlia doesn't have a TON of bad habits, but I really don't want her to be 100% controlled and polite all the time. I think a lot of people probably think I'm crazy trying to get her to be more amped up, more excited, playing tug with her like I do and encouraging her to leap for the toy. She's slowly learning to try new things, but it's taken nearly a year of agility classes based much around shaping to get her there. 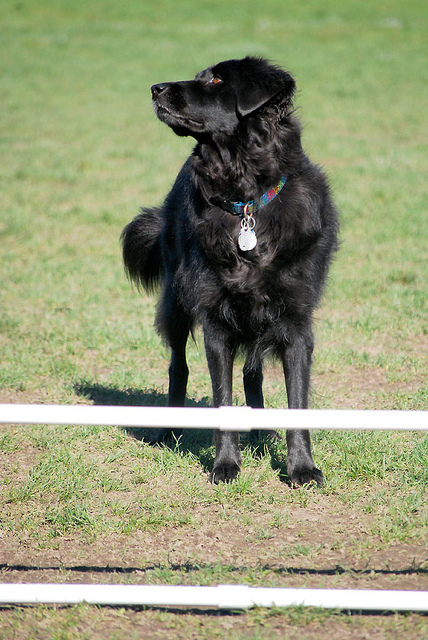 The other dogs catch on so much quicker because they were trained from puppies with shaping. Where did THAT dog come from?